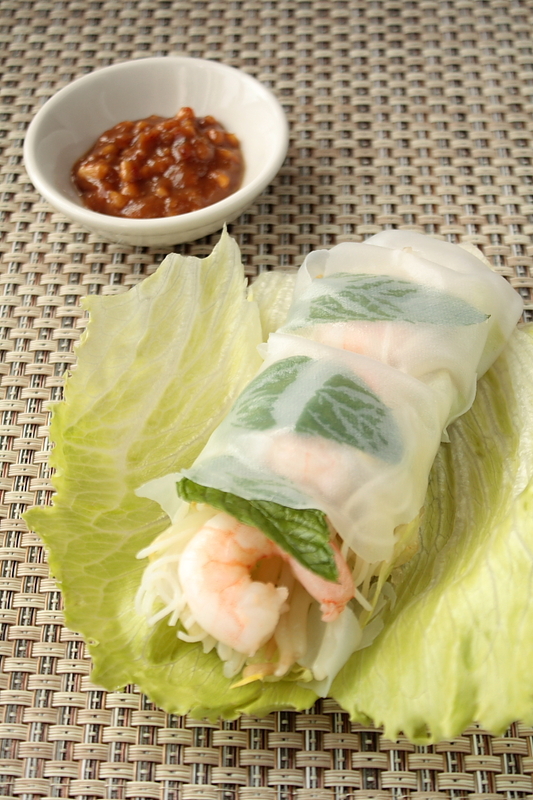 These Vietnamese Summer Rolls are the perfect snack on a hot day. Cook the vermicelli in boiling water for about 2 minutes or until they’re al dente. Make sure not to overcook them since they tend to turn into a mushy bunch very quickly. Drain and let them cool down. Fry the soy sprouts in a frying pan with sesame oil until they’re transluscent but still crunchy. Leave to cool and set aside. Finely chop the iceberg lettuce. Select 18 nice mint leaves, wash them and set aside. Mix all the ingredients in a bowl until evenly mixed. Set aside in the fridge. Fill a big bowl with hot water (don’t use boiling water, since you’ll have to stick your hands in it). Take one rice paper sheet and submerge it in the water. Use your hand to stir it around so that it collapses. You’ll notice that the sheet very quickly changes from a hard plastic-like consistency to a loose supple one. Take the sheet out once it’s supple enough to fold and it’s translucent. Transfer it onto a clean surface, being careful not to tear it, and fold it all out, so it’s sort of round again. Place three mint leave onto the middle, and top each leaf with a prawn. 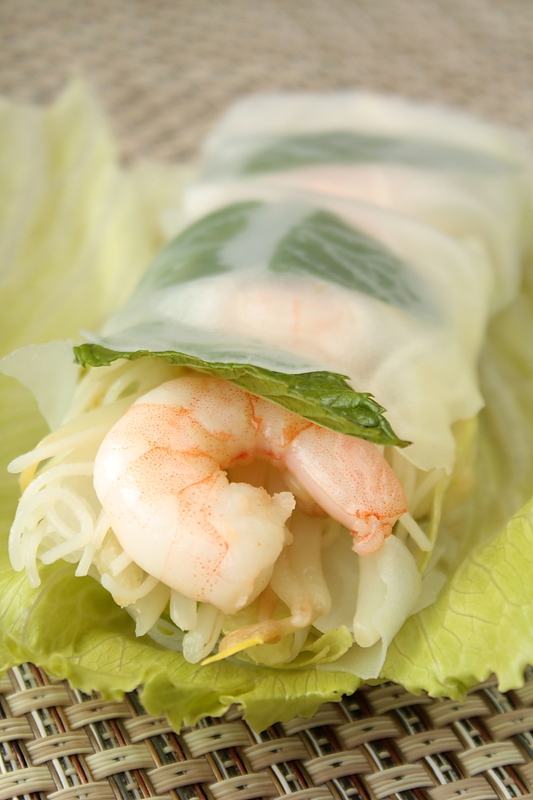 Put some of the soy sprouts on top of the prawns, then some of the vermicelli, and top it off with some lettuce. 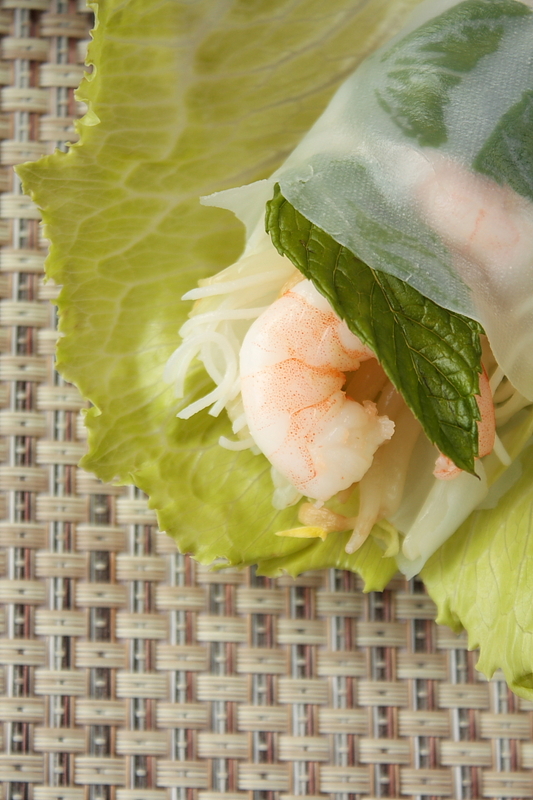 Tuck in the two sides of the rice paper on your right and left. Then roll it up into a parcel. Put a wet piece of kitchen roll on the bottom of a container (or on a plate), and put the Vietnamese salad roll on it. Cover it with another piece of wet kitchen roll. This ensures that the salad roll stays fresh and damp until you have all of them finished and that it doesn’t stick to the plate.